Whether your interest is by business challenge, a particular role, industry or discipline, see how iGrafx helps organizations around the world achieve and maintain process excellence. It’s all about one thing: delivering positive business outcomes. And depending on what is driving your organization’s desire to improve and excel, perspectives may differ. The solution doesn’t waver though: iGrafx for process-centric business transformation. iGrafx offers a rich set of process design, analysis, optimization and management capabilities that together fulfill the needs of the three key process constituencies: the IT user's needs for process modeling for implementation; the business analyst community's needs for process modeling for optimization; and the continuous improvement initiative community's needs for process methodology support. Through its modular architecture, companies can ensure that process owners, IT and compliance specialists have the tools they need to contribute to process excellence. The solution effectively adapts to the specific user requirements based on the task at hand while providing a single platform for process improvement. Let us help guide you through how our solutions can help you, whatever your perspective. Provide Transparency and Understanding throughout Organization. See multiple dimensions of your business through your processes. 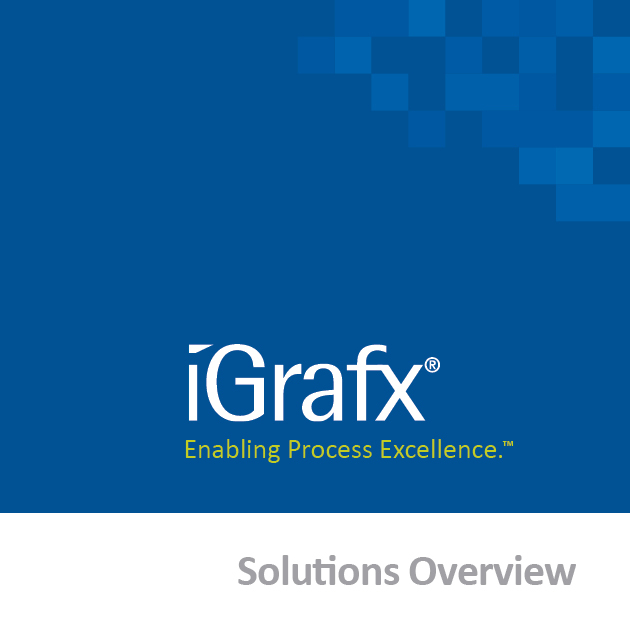 From Process Standardization to Strategic Process Management, see how iGrafx helps you address particular challenges in your quest for process excellence. iGrafx helps you not only understand and manage change, but drive transformation throughout the entire organization. See how we can help you reach your goals and contribute to enterprise-wide process excellence. iGrafx has over 20 years of experience helping organizations large and small from many different industries. See how they’ve been successful with iGrafx and how we can help you, too. Lean Six Sigma, GRC, EA...iGrafx provides you with the tools to succeed.